We have presented you some meals and some drinks you have to try if you ever visit Transylvania, now we are going to present some desserts, that you can’t leave out of the menu. Kürtőskalács is a very known Hungarian spit cake, in Transylvania it origins from the Szeklers. Earlier it was a festive treat, but nowadays you can buy it almost anywhere, from festivals to tourist places, from little villages to big cities. Kürtőskalács is made from a sweet, raised dough, from which a strip is spun and wrapped around a cone–shaped baking spit. Before roasting it over charcoal it is rolled into sugar, and while roasting it is basted with melted butter. The butter and the sugar forms a crispy, shiny crust while the dough remains soft. Kürtőskalács nowadays is served in different flavors, like cinnamon, coconut, and anything you can imagine, but I recommend the traditional flavors: sugar or walnuts. Chestnuts are more traditionally eaten roasted, but you can it is also eat it as a puree. 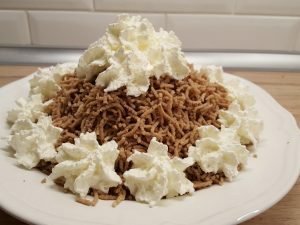 While chestnut puree is a well-known Hungarian dessert, it originated fro France: we call it gesztenyepüré, they call it Mont Blanc. The sweetened pure is made of raw chestnuts, amped up with chocolate or cocoa powder and rum, served with whipped cream on top. It has a very unique flavor, and it is a great dessert. Papanași is not a Hungarian, but a Romanian dessert, and its a must try goodie in Transylvania. The word Papanași may come from the Latin papa or pappa, which means “food for children”. The dessert is a fried or boiled pastry, made of cow túró (túró is a type of cheese, similar in looks to cottage cheese, but its a type of cheese curd), eggs, flour, grits, bread crumbs and sugar. 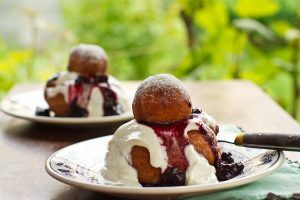 This very sweet and soft doughnut shaped pastry is served in a sphere on top, covered in sour cream and sour jam, giving the perfect balance between sweet and sour.